One of Paris’ most popular tourist attractions is Cimetière du Père-Lachaise. Many Americans visit this cemetery to pay homage to Jim Morrison, the lead singer of the 1960’s rock group The Doors, who died of a drug overdose in Paris. However, there is so much more. Engraving of Père-Lachaise on the outskirts of Paris, VII century. This 43 hectare (109 acre) cemetery is also rich with its cobblestone roadways, carefully manicured landscapes, sculptures, and monuments of many famous French authors, musicians, artists and statesmen. Nicolas Frochot developed the cemetery in 1804 and persuaded the state of France to rebury Moliere, La Fontaine, Abélard and Héloise here. Today there are over 1,000,000 people buried in Père-Lachaise and 100,000 tombs, each unique and elaborate. I strongly encourage mapping out this treasure hunt ahead of time in order to locate the more well known monuments and make the best use of your time. 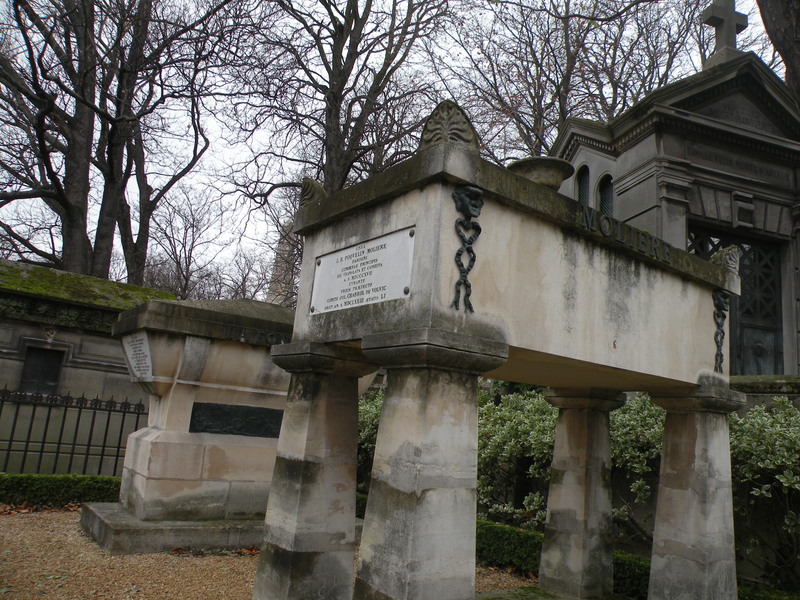 I was actually introduced to Cimetière du Père-Lachaise in Honoré de Balzac’s famous novel, Père Goriot (1835). At the end of this novel the protagonist Rastignac stands by Goriot’s grave and looks out onto the city of Paris. 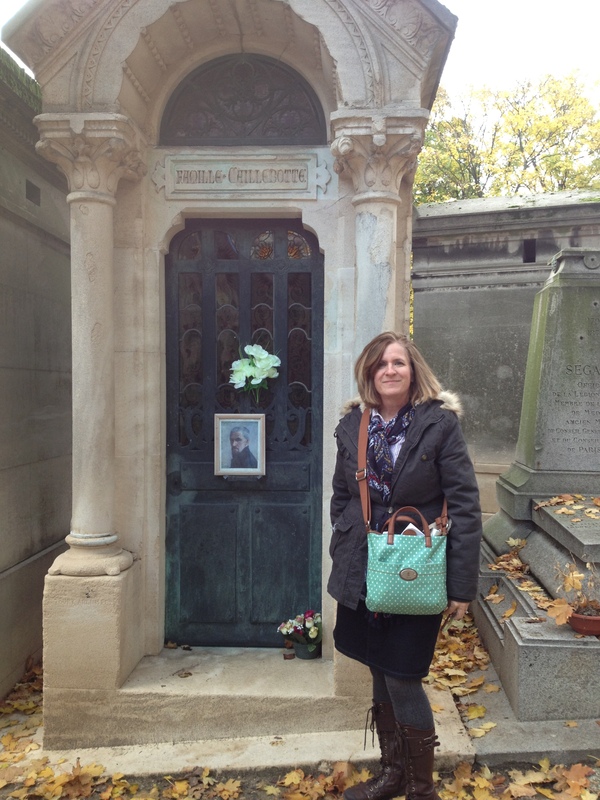 Fifteen years after writing this novel, Balzac was buried in this same cemetery. I first visited Balzac’s grave in 2006 to try and identify what the author was imagining as he wrote this doleful scene of at the end of Père Goriot’s life. Ten years later, it is still a mystery! 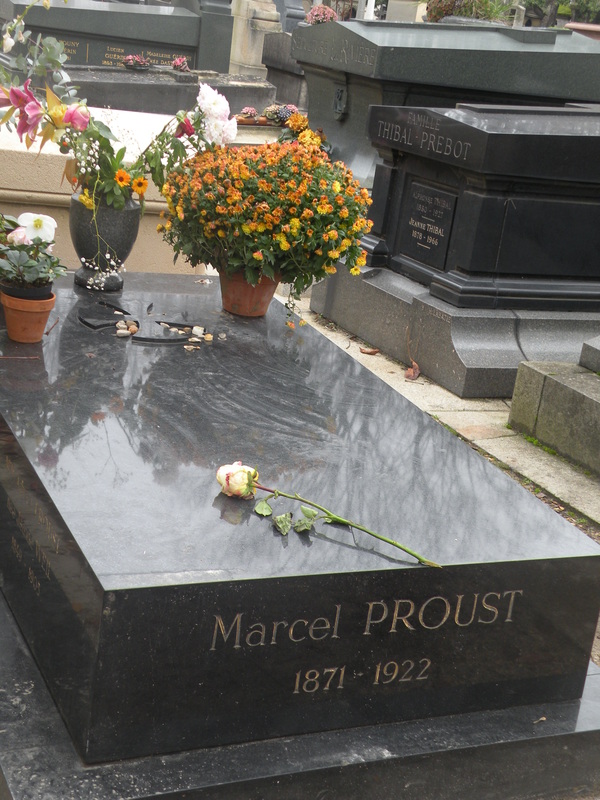 In Père Lachaise cemetery you will find the graves of other literary figures such as Marcel Proust, Victor Noir, Charles Nodier, Colette, Apollinaire, Daudet, La Fontaine, Moliere **, Colette, Americans Gertrude Stein and Alice B. Toklas, and Irish author Oscar Wilde. Musicians buried here include Bizet, Chopin, Cherubini, Poulenc, Rossini, and Dukas, as well as opera singers Maria Callas and Edith Piaf**, dancer Isadora Duncan, and American rock and roll star Jim Morrison (the most visited grave). Artists are among the largest group buried here in Cimetière du Père-Lachaise. They include Caillebotte** (my favorite, see post), Corot, Pissarro, Modigliani, Jacques-Louis David**, Gericault, Ingres, Georges Seurat (Paris, La Grande Jatte), Signac, glass sculptor Lalique, Max Ernst, Delacroix, photographer Nadar**, and sculptor Cartellier. Philosophers, Scientists, and Statesmen include: Abelard, Cuvier** (the founder of paleontology), Étienne Geoffroy Saint-Hilaire (who accompanied Napoleon on his expedition to Egypt see my blog post here) , Gay-Lussac, Georges Haussmann **(architect who rebuilt Paris in 19th century, see post), and Thiers. 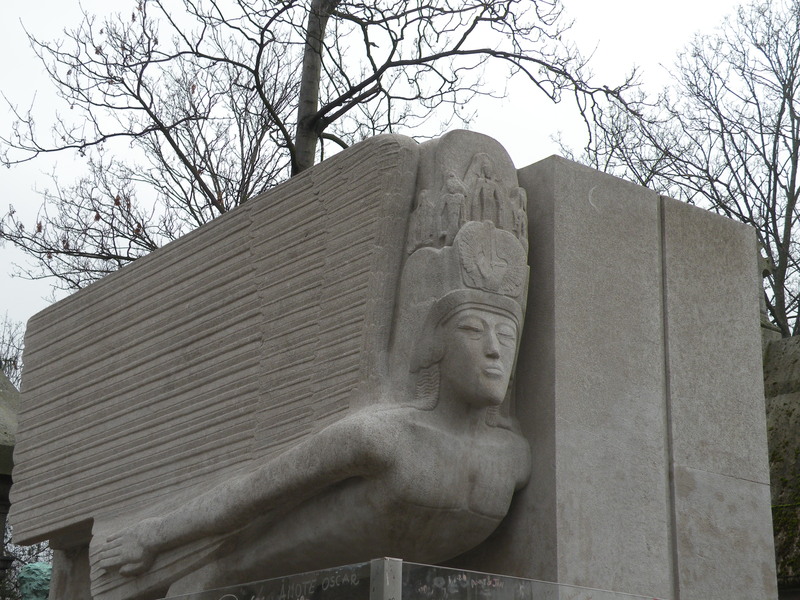 If you’re an old movie buff, you’ll want to locate the gravesites of Sarah Bernhardt, Yves Montand, and Simone Signoret. I have seen most of these graves on my list, but it has taken many visits to find them! The fall is my favorite time as the cool autumn wind blows through the fallen leaves. It is so quiet and peaceful, even with its many visitors. This cemetery is such an incredible monument to the history of France and the men and women who contributed to its advancement and heritage. It is the only one of its kind in the world. Previous Previous post: France, Revisited: Solques Bruno boulangerie: best flan in Paris! I love this place, a real village with street names. You can actually ask a map at the entrance, with all the famous names and exact location. One of the most interesting and bizarre tourist destinations in the world. The crowds are amazing. Our fascination with death, celebrity, and memories interact in this place.